We’re excited to announce that VirtualSpeech Co-founder, Sophie Thompson, has been awarded the Venus award for Inspirational Woman in Tech. What is the Venus Award? 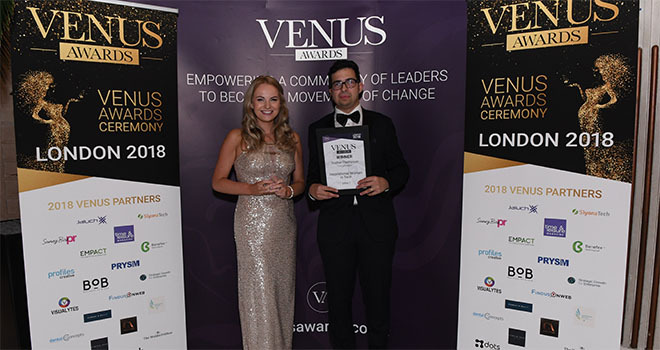 The Venus Awards are high profile events that recognise and reward women in local business for the outstanding contribution they make to communities and society. The Awards started in 2009 and have since developed into a growing number of successful regional events, with London 2018 being their 35th. Sophie Co-founded VirtualSpeech while she was still at University as a way of overcoming her fear of public speaking. Within 18 months she went from not being able to order her own food at a restaurant to speaking live on BBC World News and virtual reality played a big part in such a change. VirtualSpeech combines traditional learning methods with practice in virtual reality. Learners use realistic virtual environments such as speaking at a conference, or being ambushed by hostile journalists, to practice and effectively prepare for these real-world situations. VirtualSpeech offer e-learning courses on a range of soft skills to individuals and enterprises, as well as specific tools for trainers to enhance their in-person training sessions. VirtualSpeech have worked with numerous companies and universities around the world, including Wilhelmson and Accenture, and have authored several industry leading white papers on VR training for soft skills.